As April progresses and spring storms continue (read: snow), I look forward to May and the start of the summer market season. Already that wonderful question rings in my ears: What do people do with it? 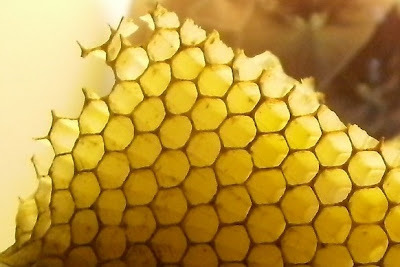 Meaning beeswax, of course: What do people do with beeswax? And I wonder, shall I answer the same old way? Or shall I make up a fun little quiz and say: Glad you asked, I just happen to have this fun little quiz I’ve put together about the many uses of beeswax … Ta da! All answers correct, consider yourself Queen Bee for a Day—go lay some eggs and be fawned over. Half the answers correct, you are a Good Worker Bee—keep working. Less than half, but at least one, consider yourself a Baby Bee—keep an eye on the workers, you’ll learn. Zippo? Nothing? No answers correct? You are a drone. Service the Queen, then leave. A. So many artistic uses for beeswax—try smearing it on walls. B. To make sewing easy, lightly coat your thread with beeswax. C. Beeswax helps make beautiful music. D. Beeswax helps with making it colorful. E. Expecting rain? You might want a little beeswax. G. Some people get their teeth into it, or is it the other way around? H. Beeswax makes the best candle. I. Please don’t try this at home. L. Beeswax makes a home sweet home. Most answers can be uncovered via the links at the bottom of the Beeswax Page. Or check back next week for the answers.